Todd Bertuzzi scored twice on Saturday night, carrying the Detroit Red Wings to a 2-1 win over the Columbus Blue Jackets in the first game of a home-and-home series. Detroit goalie Jimmy Howard made 28 saves in the win, including 14 in a first period that saw the Red Wings badly outshot. Antoine Vermette opened the game’s scoring with 7:50 left in that opening period. Jakub Vorecek picked up the puck in the Detroit end on a miscommunication between Derek Meech and Valtteri Filppula. Howard stopped Vorecek’s chance but Vermette scored on the rebound to put Columbus in front. Detroit nearly tied the game early in the second when a Brad Stuart shot deflected off of R.J. Umberger before hitting both posts and bouncing out. Bertuzzi scored his first of the game to even things up, taking a feed from Pavel Datsyuk in behind the defense and cutting around netminder Mathieu Garon for a power play goal at 6:38 of the second. It looked like Columbus would retake the lead with three minutes left in the middle period but a tremendous defensive play by Darren Helm kept the game tied. A shot from Umberger bounced over Howard and was headed into the net before Helm swatted the puck up into the air at the goal line and then batted it out of the crease with his glove. Bertuzzi would add his second at 2:44 of the third to put the Red Wings in front. Brian Rafalski fired a shot from the blue line intentionally wide of the net and Bertuzzi was there to pick up the puck as it came out the other side, banging it into the open cage. In the game’s closing seconds Filppula put a shot off the side of an empty Columbus net but the Wings held on without the insurance goal. Bertuzzi’s first goal was the game’s only power play tally. The Red Wings had five chances with the extra attacker while the Blue Jackets had four. Garon finished the night with 25 saves on 27 Detroit chances. The two teams meet again on Monday in Columbus. Rafalski and Filppula returned to the Detroit lineup. Rafalski had missed one game with the flu while Filppula had been out since October with a broken wrist. The Red Wings are now down to seven injured regulars. For the second consecutive game the Detroit Red Wings were shutout by the Chicago Blackhawks. After suffering a 3-0 defeat on the road on Sunday, the Red Wings returned to Joe Louis Arena to drop an identically-scored rematch Wednesday night. Antti Niemi stopped 33 shots en route to the shutout after Cristobal Huet backstopped the Blackhawks on Sunday. Patrick Kane, Patrick Sharp and Jonathan Toews scored for Chicago. Kane opened the scoring with a power play goal 30 seconds into the third period, snapping a shot from the left faceoff circle past Detroit goalie Jimmy Howard through a screen by Troy Brouwer. Sharp banged a loose puck off of Detroit’s Drew Miller during a goal-mouth scramble to put the Blackhawks up by a pair at 3:47 of the third. Toews wrapped up the scoring with 1:18 left in the game, beating Howard on a shot from the slot that just trickled through. Howard finished the night with 28 saves on 31 shots. In addition to their numerous injuries, Detroit played without defenseman Brian Rafalski, who missed the game with the flu. Jakub Kindl was called up from the Grand Rapids Griffins to take his spot in the lineup. The Red Wings may be down yet another player tonight when they host the Chicago Blackhawks. Brian Rafalski skipped the morning skate with flu-like symptoms and Jakub Kindl has been called up from the Grand Rapids Griffins. Should Rafalski be unavailable tonight, that puts Detroit back at missing nine of their eighteen regular skaters. 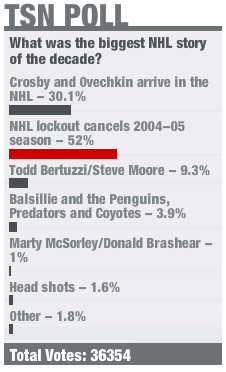 Just over half of TSN’s hockey readers think that the NHL lockout was the biggest story of the decade. I’m one of them so I’m not surprised. What I simply can’t believe is that nearly a third of voters think that Crosby and Ovechkin are bigger stories than missing an entire season of hockey. I just don’t know what to say to that. The latest update on the H2H campaign is that $1848.19 has been raised. Over at The Triple Deke, they’ve made a commercial in support of bringing Herm to Hockeytown. If that doesn’t make you feel at least a little better, you may not have a soul. The Detroit Red Wings assigned forward Kris Newbury to the AHL’s Grand Rapids Griffins, the team announced on Monday. This leaves the Red Wings with only eleven healthy forwards. Mattias Ritola will be called up from Grand Rapids to fill the open position. Their four-game winning streak snapped yesterday in Dallas (you didn’t actually expect me to recap that, did you? ), the Red Wings head to Chicago for the first of a home-and-home with the Blackhawks. Chris Osgood gets the start for Detroit while Cristobal Huet goes for Chicago. I remember Osgood was strong in his last start but it feels like that was about a month and a half ago. Huet… We can hope he continues being himself rather than one of the many awful goalies that the Wings have made look good this season. This is an FSD+ game, which is better than a Versus game but you still might need help finding it on your cable provider. Title stolen from Baroque over at A2Y. So anyone who reads A2Y, Snipe Snipe, Dangle Dangle, or is multilingual and is a fan of Red Wings Brasil is already familiar with Guilherme, owner of the last of those blogs. A longtime poster at A2Y, “Herm” has never been to the US, let alone to Detroit for a Wings game. The Chief wants to change that. The official Bring Herm to Hockeytown campaign is on. The “19” from A2Y will be in attendance at the March 26th Wings – Wild game. If enough money can be raised, that will include Herm. With the holidays upon us, I’m not asking anyone to make a donation. This time of year there are many more important causes being highlighted and I’m not trying to take anything away from those. That said, if you’re interested in being a part of something fun and relatively unique, take a look. I’ve RSVPed for the game so there’ll be a DH.N contingent. Let me know if you’ll be there. In short, Zata’s gonna miss some time even if he’s just sore. Let’s do this math. NHL teams dress twenty players for every game. Two of those are goalies, leaving eighteen skaters. Andreas Lilja. Johan Franzen. Valtteri Filppula. Jason Williams. Niklas Kronwall. Dan Cleary. Darren Helm. Jonathan Ericsson. Henrik Zetterberg. That’s nine skaters right there. Nine. Going into Saturday’s game in Dallas you can expect the Red Wings to be playing with a roster half made up of players who weren’t even supposed to be on this team. Justin Abdelkader was supposed to spend the season in Grand Rapids. Kris Newbury and Doug Janik have spent most of the season there. Brad May wasn’t even signed to an NHL contract when the Red Wings opened the season in Stockholm. Drew Miller – who scored a beautiful goal Thursday night against Tampa Bay – was playing for the Lightning when the season kicked off. And yet the Red Wings sit six points ouf of first place in the Western Conference with three games in hand.